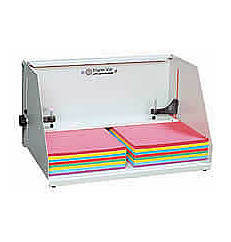 The Martin Yale J1811 Padding Press handles most small padding jobs, and is designed to allow small or large print shops to quickly and easily make their own carbonless forms, note pads, and scratch pads with maximum dimensions of 5.75″ high by 17.75″ wide. The sturdy metal construction gives the J1811 Padding Press the reliability under normal usage print shop operations. The tip-back design insures that stock is always square, so buy the Martin YaleJ1811 Padding Press today and start making your own pads in no time! If you have any questions or are interested in purchasing the Martin Yale J1811 Padding Press, visit us at SpiralBinding.com. We have great pricing on a full line of Padding Machine. Call us at 1-800-631-3572 for more information!